November wasn’t quite the month I had hoped it would be. I am still working to get my running back; and while I did get some good pain free running in, I wish I could have done a few more miles. I have been really struggling to find a way to get three solid runs in a week. My living situation makes it difficult but I think I finally worked out a plan! The highlight of the month was enjoyed vicariously through my best friend. I have watched him go from “Dirt to Iron” over the last year and it all came together on November 18th when he successfully completed Ironman Arizona. I had the privilege role of Sherpa and loved every minute of the day! 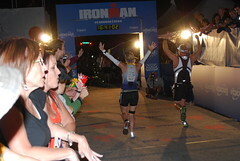 If you ever have the chance to watch an Ironman from start to finish, DO IT!!!! It may change your life! My sites are really focused on Boston and while I have realized that my original goal of getting a new PR there is not realistic I have modified my goal to having a good solid run that I am in control of from start to finish. I have also been rounding out my 2013 calendar and I added Barb’s Race in July as a lead up race to Challenge Penticton. I do need to fund raise for this race so if you have $10 to spare I would be very appreciative! I LOVE that sign!!! I was wondering if you mind if I borrowed it and put it on my blog as my Wordless Wednesday? I’ll link back to your blog. If not, no worries. That is so awesome that your friend finished IMAZ. I’m doing my first 1/2 Ironman next year. 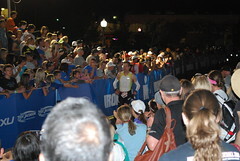 I really want to volunteer at Ironman St George next year. I don’t know if I’ll have the time or money to do it though. Congrats on all of your miles for November! That’s quite a bit of miles. Steal away and link back!! LOVE IT! Thankyou…there is no way could I have done it without you. I am so glad you were there every step of the way! I don’t want to be any other place! Good luck with your plan and running goals!